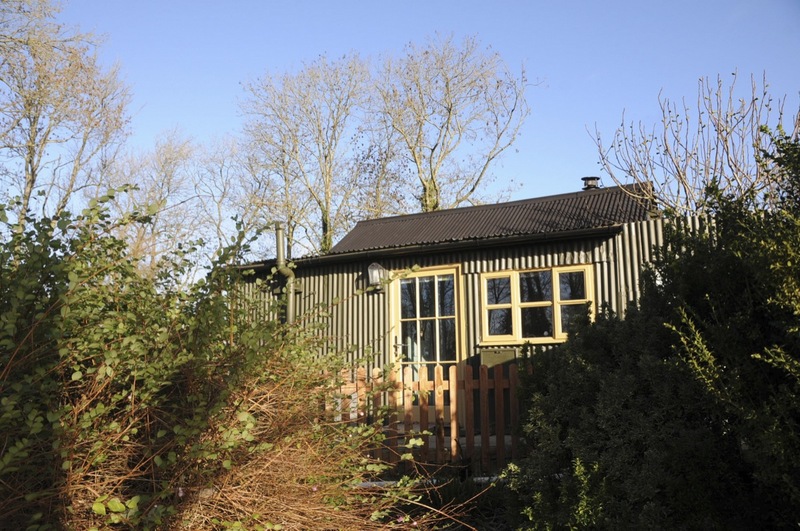 The corrugated cottage was built in the spring of 1940, around the beginning of the Second World War when Britain felt under imminent threat of invasion. The cottage was built for the Women’s Land Army, or ‘land girls’, who were young women working in agriculture to help the war effort. More than a third of land girls came from major cities, so many rural accommodations had to be built. The cottage is built out of corrugated iron with tongue and groove wooden panelling inside with insulation between . It stands alone beside the owner’s house in some small woods with lots of badgers, foxes and tawny owls! The cottage is just a few miles from Glastonbury on the edge of a small village called Baltonsborough, including a shop, post office,church and pub within short walking distance across the fields. The cottage has been recreated in the style of the 1940s, with authentic details such as a forties enamelled range with back boiler, forties utility furniture, a functioning radiogram from the fifties and Bakelite switches and plugs. The kitchen includes an original fifties sink, larder and fridge with a modern electric hob and microwave. In the bathroom is a claw-foot roll top bath and toilet with elevated cistern. The cottage sleeps four people, with two bedrooms and four single beds and an additional sofa bed. The bedroom upstairs is reached by a steep staircase and very low doorway with a very low ceiling, so is unsuitable for disabled or elderly people (but brilliant for children!). The house has wireless internet and no television. The house is well-insulated and includes both a coal fire range with back boiler and electric heater. The house includes an Anderson shelter in the garden. Safe from the threat of the Nazi Luftwaffe, children can now make it their den! Hi, Is the corrugated cottage available for 3 people for 3 nights , arriving Friday 15th , departing Monday 18th July? If o what is the cost and how would I pay ?